A confidential, understanding and safe place for support through your grief. 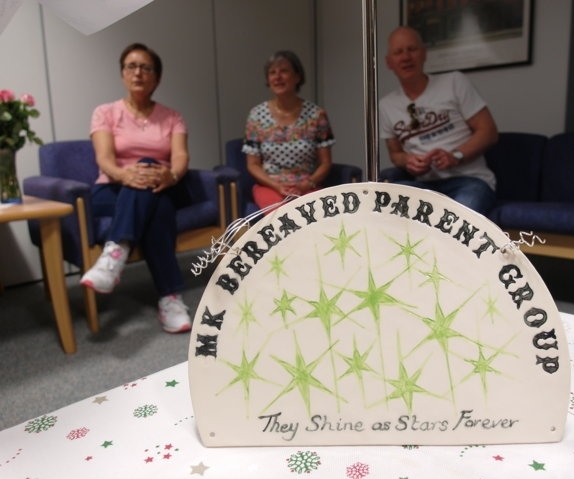 The group was established in 2009 by a small group of bereaved parents and health care professionals brought together through the loss of a child. Our meetings are very informal, we talk, laugh and cry together, share stories of our children and support each other through the daily struggle of coping without our children. The overall aim is to help each other deal with the situation we all thought we would never have to face. Any bereaved parent is welcome, you do not have to participate or stay, what we can guarantee though is a warm welcome and plenty of tea, coffee, tissues and support. Meetings are held every third Thursday of the month from 7.30pm – 9.30pm at Age UK, The Peartree Centre, 1 Chads Lane, Peartree Bridge, Milton Keynes MK6 3EB. We come together every month to share stories about our children, talk about how we all deal with different situations as parents we never thought we would find ourselves in. The meetings are informal with little structure. We open a meeting with a poem, reading or just a thought which may capture what someone is thinking or experiencing. How do people deal with anniversaries, Christmas’s without their child, or that 21st birthday, or wedding day we will never experience? What can you say when people tell you to move on and that you will just get over it as time passes? We can’t proclaim to have all the answers to these and many other questions. What we do have is experience of losing a child, many of us have lived through the anniversaries and holidays alone and share how we cope, how we chose to mark special dates and prepare for the harder days ahead. Many mums and dads have attended the monthly meetings, supporting each other and forming friendships built on that understanding even some of our closest friends and family don’t have if they have never experienced the loss of a child. Some people come to the meeting and just listen to others, some parents come and find it a relief to be able to talk about their children and share memories with other people without them feeling uncomfortable or trying to change the subject to move the conversation along.